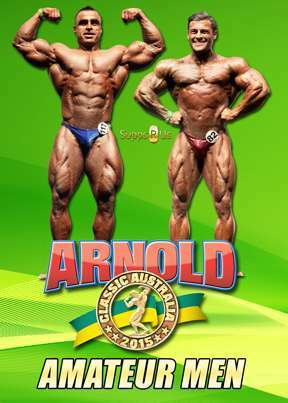 This Men’s DVD presents all of the classes of the MEN’S BODYBUILDING, JUNIORS, NOVICE & MASTERS BODYBUILDING, CLASSIC BODYBUILDING and MEN’S PHYSIQUE. See all of the lineups, key comparisons and callouts plus posing by the top guys, and all awards, plus the OVERALL POSEDOWN and a Pro card, won by ATIF ANWAR AHMED from Darwin, Australia. The MEN’S PHYSIQUE OVERALL winner was GIOVAN MEDINA of Australia and he also received a Pro Card. This Men’s DVD presents all of the classes of the MEN’S BODYBUILDING, JUNIORS, NOVICE & MASTERS BODYBUILDING, CLASSIC BODYBUILDING and MEN’S PHYSIQUE. See all of the lineups, key comparisons and callouts plus posing by the top guys, and all awards, plus the MEN’S BODYBUILDING OVERALL POSEDOWN and a Pro card, won by ATIF ANWAR AHMED from Darwin, Australia. The MEN’S PHYSIQUE OVERALL winner was GIOVAN MEDINA of Australia and he also received a Pro Card. Includes posing by the top 6 in each class where posing is appropriate. The Overall Men’s Bodybuilding Award was presented by Arnold Schwarzenegger. COMPLETE 2015 ARNOLD CLASSIC AUSTRALIA PRO RESULTS & STRONGMAN.